Over the last couple of months we have been experimenting with adding encryption to our artists’ websites. 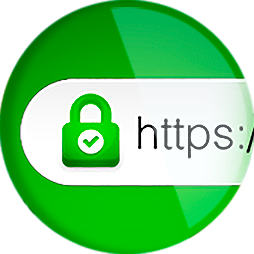 Encrypted websites all have "https" (the "s" stands for secure) at the beginning of their domain names and are sometimes called a “secure website”. Encrypting a website used to be an expensive and technically difficult feature to add to a website. But, we have automated the process and have now added SSL/TLS Certificates to ALL our artists’ websites for FREE! All of our existing artists’ websites are now encrypted by default. Some of you might ask: Why? While there isn’t one overriding reason, a number of small changes have coaxed us in this direction. Fundamentally, encryption makes sure that someone cannot snoop on the web page data being transmitted between your computer and our servers. When you access your website or Admin Panel, that information is most often intended to be published publicly on your website. So, this protection is generally not critical to most of our artists. That said, encryption does protect your website from being manipulated, either as you send data to it or when visitors view your website. And, while this hasn’t been an issue for any of our artists websites, it can present a potential problem. Starting in 2017, Google will start ranking websites that support encryption higher than those that do not. While this increase in ranking is currently not large, it may result in slightly more traffic to your website and that’s when having a secure website starts to become more important to our artists. Ultimately, this action by Google is what spurred us on to add encryption to all of our websites. In most cases, you will not likely see any differences on your website. In some web browsers, you will see https:// in front of your website address; others do not show this. All web browsers will show a little lock icon somewhere on the address bar, usually just to the left of the web address. The difference between http:// and https:// is pretty subtle. For those of you, who have embedded "widgets" on your websites, e.g. YouTube videos, StatCounter, or codes from any other websites, there may be a problem with the “embed code”, especially if it was embedded a long time ago. If you see any issues, please let us know and we're more than happy to help you troubleshoot and fix the issue! Also, if you have a page with some embedded "http://" (with no "s") items, e.g. a photo or video, the lock icon may not show up. So, if you don't see the lock icon on specific pages of your website, simply let us know and we will look into it! We're simply trying to make sure that your websites get the most traffic possible and that we keep your website updated with Google's latest search and technical recommendations! As always, if you have any follow-up questions, we'd love to hear from you!